What would you do if you were brave? | Enjoy Life and Do Good! In the past few years, many people have told me that they think I’m brave because after my husband’s death I sold our home, moved to a small high-rise condo in-town and started a new life. To me that wasn’t brave. It was the next logical step. Since then I’ve had several adventures including taking a motorcycle riding class, doing a challenging ropes course and taking a dirt bike class. I didn’t do them because I wasn’t afraid. I was. I did them anyway. Jana’s song says, “If I refuse to listen to the voice of fear, would the voice of courage whisper in my ear?” I say, “Yes!” I think back to my childhood. I was scared of most everything. I was afraid of going to the mailbox after dark or stay home alone. Somehow even as a child I reasoned with myself that if I was always afraid I would miss out on a lot of things. I learned to be afraid without letting it stop me. I learned to channel the fear into excitement. When I moved away from my family, started traveling with work, flew for the first time, got married, learned to snow ski, started a business. I was afraid but my desire was stronger than my fear. When my husband was diagnosed with a brain tumor I was terrified. In order to support him, care for him and then learn to live without him I had to walk through my fear. People said I was brave. That’s where I learned that “sometimes what looks like courage is just fear pointed in the right direction.” I could not give in to fear. I had to channel that fear into action that would make a difference. Now my adventures remind me that I’m brave. 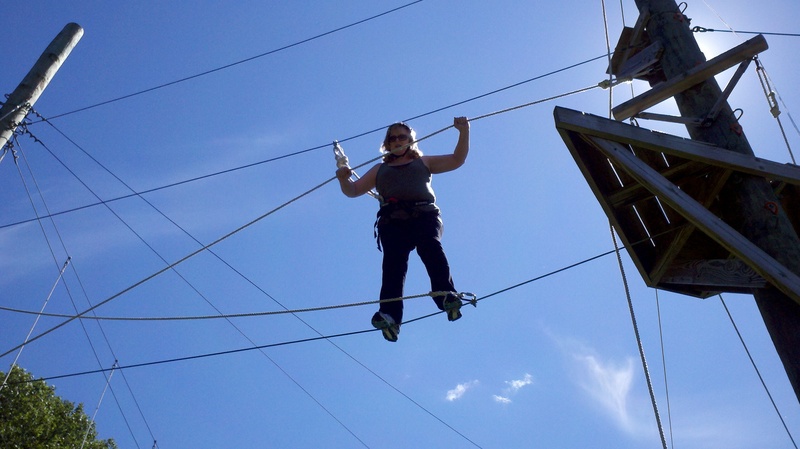 When I climbed the ladder to the first platform on the ropes course, I was afraid. It felt exhilarating. The adrenaline was pumping and I tapped into the courage that I knew was there. John, the instructor, had made me feel safe. He said I could not fall. Could. Not Fall. If I fell off the ropes the cable would catch me and I’d be rescued. I would not fall to the ground. I trusted him. I trusted the cable. I knew that even if I didn’t make it I was going to try. If I failed he would rescue me. I listened to his instruction and guidance. I stepped out in faith. I made it safely across three sections. I fell in the middle of the fourth section but the cable caught me and John came out and guided me to the end. Then I celebrated with a fun swing on the zip line. I felt brave. As I sit here today asking myself, “What would I do if I were brave?” I know I’ve done things that made me feel brave. I’ve done things that other people saw as brave. I personalize the lyrics of Jana’s song and ask myself. “What if I’m meant to do what I secretly dream? What would I ask if I knew I could have anything?” I look at how I’ve allowed other stuff to get in the way of what I really want. “Creative avoidance” my friend calls it. When we create things, problems or projects to divert our attention from what we say we really want. I think of what I want to accomplish with my life and ask myself, what would I stop doing if I were brave? What would I create time for if I were brave? What would I let go of if I were brave? This entry was posted in Live with Passion and tagged adventure, brave, Courage, Fear, inspiration, Jana Stanfield, live with passion, Marianne Williamson, mid-life, Oprah by Myra McElhaney. Bookmark the permalink.